Heat the chicken stock in a medium sauce pan, bring to a boil and then turn down to a simmer. Heat a small, heavy bottomed sauce pan over medium heat. Add the olive oil, onion, and fennel, saute for 3-4 minutes until translucent. Then add the garlic, pumpkin, nutmeg and red chili flakes, saute for 1 more minute. Turn the heat to medium high and then add the Chardonnay. Start adding the stock a ladle at a time to the rice mixture, make sure to stir often. Continue to add a ladle of stock as each one is absorbed. Cook until the rice is tender, but still has a “bite” to it, about 20-25 minutes. Remove from the heat add the parmesan cheese, lemon juice and sage. Season with salt and pepper to taste. 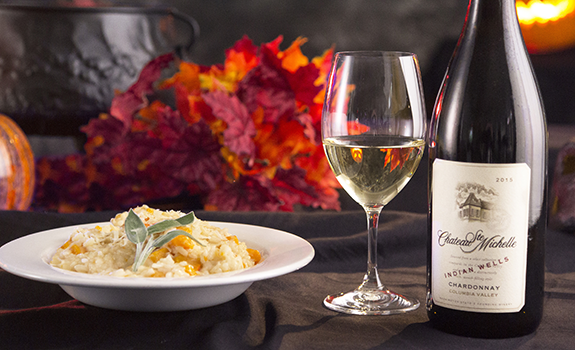 Serve immediately and extra cheese if you want and Chateau Ste. Michelle Indian Wells Chardonnay!